A few years back I took my daughter on her first trip to Canada’s Wonderland and she taught me a little bit about fun, about how the merry-go-round could be every bit as exciting as the thrilling roller coaster rides and about how wonderful it is to be able to experience an amusement park through your kid’s eyes. During that trip, one of the highlights of our day was visiting the Dinosaurs Alive portion of the park. 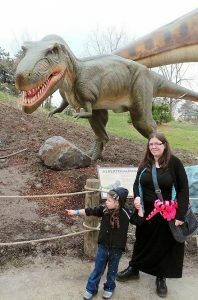 When we were later invited back to attend pre-opening day for the 2014 Season, Dinosaurs Alive was at the top of my daughter’s “Things We Must Do” list. 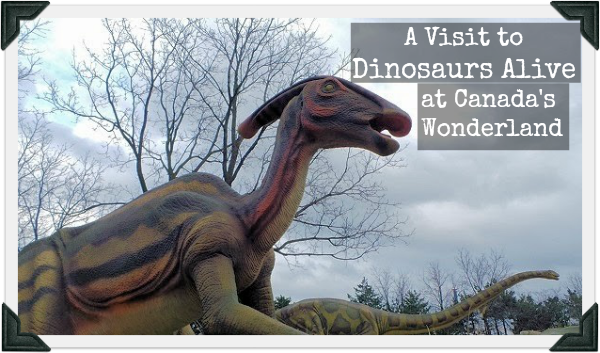 She couldn’t wait to share the experience with her little sister, and, well, neither could I.
Dinosaurs Alive is a separate gated area of the park where you walk along a path with life-size dinosaurs off to either side. If that’s all it was it would still be worth seeing. It’s awesome to walk alongside the dinosaur sculptures, see their colourful patterns and get a true sense of scale. 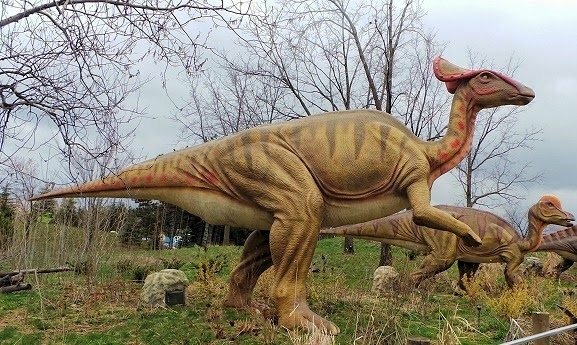 However these dinosaurs are not simply statues, they are life-sized robotic puppets, and there are over forty of these animatronic creatures spread out along the walk. There are motion sensors along the pathway, and when they sense people approaching it triggers preset movements for the dinosaurs. They roar, they open their mouths and show off their teeth, their sides move up and down as they “breathe” and their heads turn to face you. Yes, my youngest was a bit nervous at first, but she quickly came around. At some stations, you can push buttons to make each part of the dinosaur come alive, basically seeing how the puppets work. I found this was a great way of showing my kids that the dinosaurs, while fascinating, were not “really real” and for all the noisy roars were not going to eat them. Each group of dinosaurs has a plaque alongside it to explain a bit about them and what time period they came from. These are wordy, scientifically accurate and were a bit too lengthy and detailed for my kids (who were 4 and 6 at the time). I ended up skimming as fast as I could and picking bits from each story to read to them. 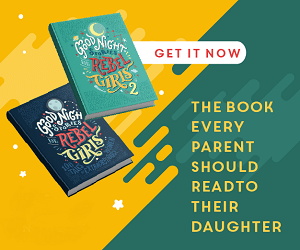 For the youngest, her favourite part was staring at their teeth and identifying which were carnivores and which were herbivores. She insisted I not skip a single plaque and wanted to know, and repeat back to me, every dinosaurs full name. I love that my kids are eager to learn and am certainly not going to turn down their pleas for an impromptu science class at the amusement park. It took us about 40 minutes to walk through Dinosaurs Alive. For older kids who are eager to learn dinosaur facts, you could easily spend more time at each “station”. This time around it was cool, overcast and rainy, but I speak from previous experience when I say there is very little shade along the pathway through the Dinosaurs Alive area and on a hot sunny day the sunshine can seem a little relentless, hats and sunscreen are definitely recommended. About three quarters of the way through the walk there is a large sandpit where kids can dig for fossils. The fake life-size dinosaur bones are cemented to the bottom of the sandpit. Using tools similar to what a palaeontologist would use, kids get to play in the sand and unearth bones. Around the outside of the pit are several benches for parents to sit and relax, there are a few umbrellas offering shade, and even a vending machine if you feel like buying a pop or a water. On our last visit, I was disappointed to notice that some of the dinosaurs hadn’t fared so well over the winter. Several had new gashes in their “skin” where the foam underneath was showing through. On the upside, they have continued to add new dinosaurs to the exhibit (for example an entirely new scene featuring Theropods). I’m taking this as a sign that they are still putting money back into the exhibit and will hopefully quickly repair any problems we noticed. 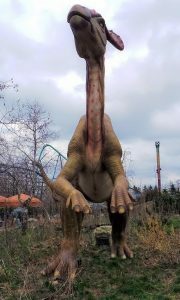 Dinosaurs Alive is not included in your general Canada’s Wonderland admission. You need to purchase a separate ticket (which you can get ahead of time, or at the gate to the area). Depending on how long you spend at the sandpit, you could easily spend an hour or more in the Dinosaurs Alive area, making it, I feel, well worth the additional admission. If your children are dinosaur lovers this add-on area is a must see. My kids still talk about it frequently and ask to go back. It was definitely one of their favourite parts of Canada’s Wonderland. Disclosure: I wrote this post after attending the pre-opening day festivities at Canada’s Wonderland, back in 2014. This post was originally published on Travelling Maple. Since that site has been taken down, I’m resharing it here. 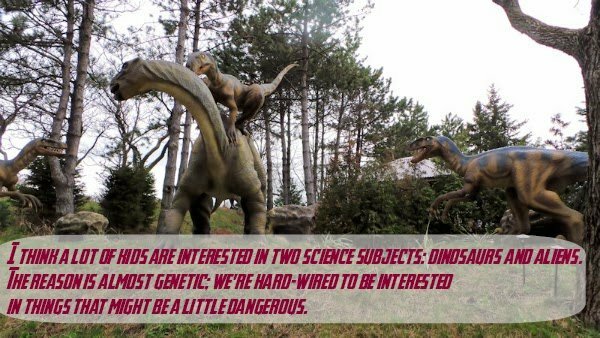 Dinosaurs Alive sounds like so much fun. 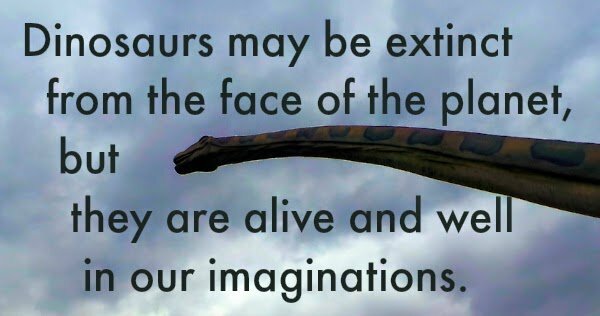 I was personally fascinated by dinosaurs when I was a kid so I would have enjoyed this. I love that they have motion sensors that allow them to respond to your presence! Very neat and different than going to a typical museum or exhibit!